In the mid-1800s, Ocean Avenue was a dirt road in the countryside, used by those who came for recreational purposes both innocent and illegal. 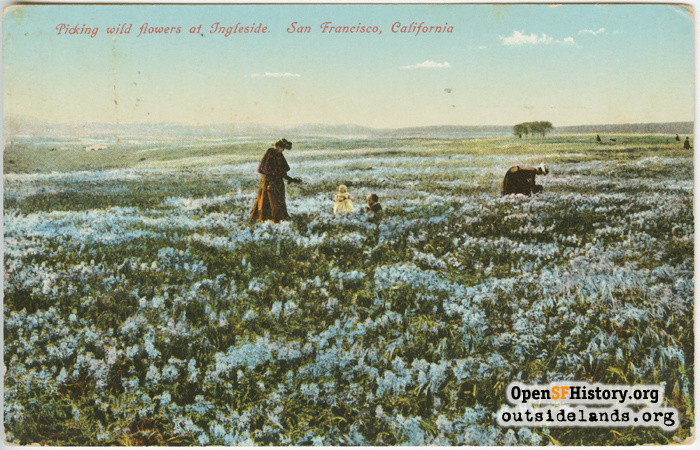 Some came to pick the amazing fields of wild flowers (shown in the old postcard at right); others came to pick horses and dogs at the gambling tracks. Despite the fact that the City Jail itself stood on the road, slightly disreputable businesses along the Ocean Road included boxing camps, shooting ranges, bars, and a roadhouse that gave the neighborhood a name. Except for the businesses along Ocean Road, the area surrounding the Ingleside Inn was still mostly small farms with a paltry population. In 1890 Adolph Sutro, who owned most of the land immediately north and south of Ocean, attempted to change that with a promoted subdivision he called "Lakeview". Better transportation options, increased demands for housing, and the rising popularity of nearby developments such as Ingleside Terraces and Westwood Park finally brought the people out to Ingleside. The gambling dens on Ocean Avenue made way for pharmacies, grocers, 5-and-10 stores and other neighborhood services. The dog track became reservoirs, the jail became City College, and entertainment options moved to more innocent vices such as movies and ice skating. "Lakeview" as a name stangely migrated over the hill, with many of today's Ocean View residents calling their neighborhood by that moniker. 1. Marsha Fontes, "A History of the Ingleside Terrace," 1975. San Francisco Public Library, Ingleside branch. 2. Lakeview advertisement from broadsheet, "Samuel Johnstone, The Republic Savings...". California State Library, Sutro branch. 3. A.S. Baldwin, Estate of Adolph Sutro, Deceased, March-April-May 1910. "Lake View Blocks". California State Library, Sutro branch. 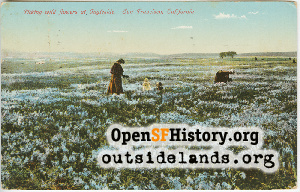 Image: "Picking Wild Flowers at Ingleside - San Francisco, California". Postcard image, courtesy of Greg Gaar. Contribute your own stories about the OMI! This project is made possible by a grant from the CALIFORNIA COUNCIL FOR THE HUMANITIES with generous support from the San Francisco Foundation, as part of the Council's statewide California Stories Initiative. The COUNCIL is an independent non-profit organization and a state affiliate of the NATIONAL ENDOWMENT FOR THE HUMANITIES. For more information on the Council and the California Stories Initiative, visit www.californiastories.org. Page launched 26 May 2003.